In a recent dream, I was in a brightly lit white room helping others find a missing object. This room had a loft. Following my instincts that the object we were looking for was in that loft, I climbed up and found a small white box. When I opened it, I was surprised to find a silver key inside, covered in dust. It’s been almost three weeks since I’ve had that “key dream” and I have been thinking about it non-stop. It’s not that I’m big fan of dream interpretation but I do wonder if there may be some sort of message here for me. Is it a key to the future? Is it a key into an unknown adventure? Or, is it a key to unlock some past mystery? 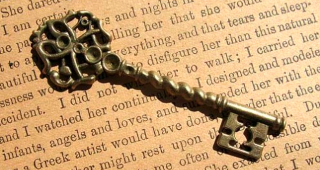 The “key dream” came up again with two articles published in this week’s Windham Eagle and I could not help myself but to apply some sort of meaning behind the dream of this dusty key to those two articles. Although one article (Jordan-Small Middle School on the front page) may appear as a key to the future and the other (Raymond-Casco Historical Society by Elizabeth Richards on page 9) seems to represent the key to the past - I think it’s possible that the key analogy here is to keep the door unlocked between the future and the past. It’s not a new concept that students are a vital resource and part of a successful, enlightened society. Without them and their contributions, life as we know it would cease to be. They are our future engineers, soldiers, dancers, musicians, teachers and historians. However, they will only be as successful as the past from which they learn. This leads me to the second article on the Raymond-Casco Historical Society. In it, you will discover the fact that many historical societies have decreasing memberships. Is it possible that in our efforts to move forward quickly into greatness, we have cast the key of the past aside, thinking it offers little to the future? After all, historians do not perform heart transplants. But history and historians offer their own valuable resource and greatness. Why? Because we all need a foundation to leap off from and into a successful future. We need the past to understand our own lives, the lives of others and how the world works. I think it would be difficult to imagine in innovative and creative ways, without having the past as our foundation, giving us the ability to update and add to that base. I think the key to the future must be used in conjunction with the key of the past in order to have the best human experience possible. If anything, we can put the dusty key to use and open the door to many more possibilities – by using the past as the foundation to spring forward into a wonderful future.